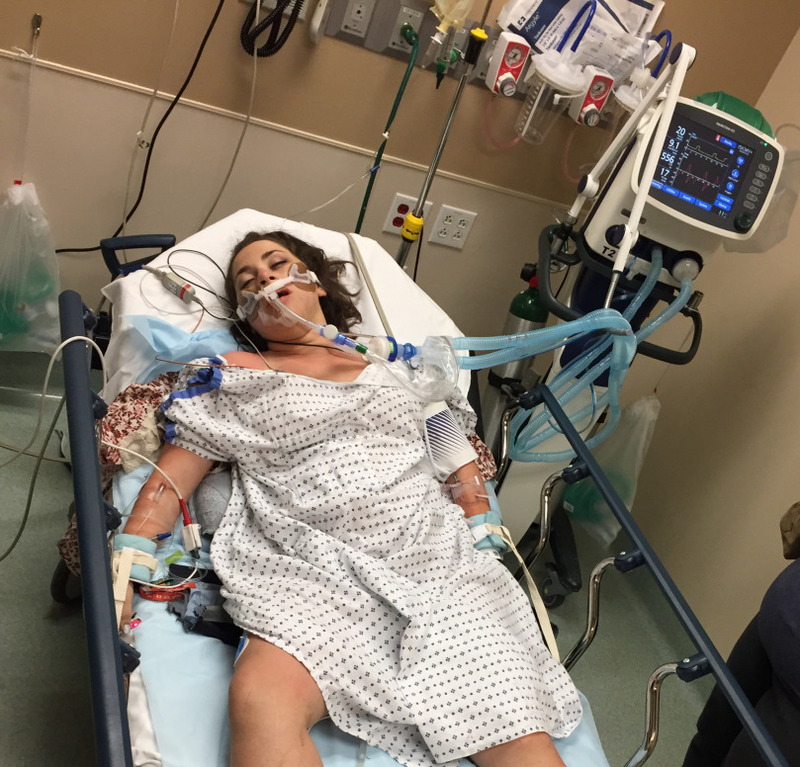 A college student from Nevada has issued a stark warning to young adults about the dangers of binge drinking, revealing how an underage drinking session at a concert left in a coma and nearly killed her. Hanna Lottritz, a journalism student at the University of Nevada, Reno, turned 21 on Wednesday, but unlike most people her age, she insists she didn't celebrate the milestone occasion by heading to the bar - nor does she plan to any time soon. Hanna noted that if she helps just one person by sharing her story, then she will be 'absolutely ecstatic'. On July 25, 2015, the college student joined her friends at the Night in the Country music festival in Yerington, Nevada, where she spend the afternoon playing games and meeting new people. Hanna recalled having two beers at the Joe Nichols and Jake Owen concert that night but because the people she was with had been drinking all day long and 'feeling good' she said she 'felt a little behind'. Hanna said she started to feel a 'little bit of a buzz' after the concert and drifted away from the people whom she went to the concert with. When she came across some of her guy friends at another campsite, she promised to 'outdrink' them. By 11:30pm, she and her guy friend were challenging each other to see who could chug from a bottle of Black Velvet whiskey the longest. According to what others told her, she claimed was fine but collapsed five minutes later and stopped breathing. Hanna's friends carried her to the medical tent where she was intubated before she was air lifted to Renown hospital in Reno. 'I was in critical condition, suffering from acute respiratory failure and acute alcohol intoxication,' she explained. 'My blood alcohol concentration was .41 when I arrived at the hospital, five times over the legal limit. Binge drinking is the most common pattern of excessive alcohol use in the United States. Most people who binge drink are not alcohol dependent. About 90 per cent of the alcohol consumed by youth under the age of 21 in the United States is in the form of binge drinks. Hanna noted that the doctors thought she was brain dead when she came in because she was 'completely unresponsive'. In addition to not responding to verbal or painful stimuli, she had no corneal reflex and her pupils were 'sluggishly reactive'. When she woke up 24 hours later, she had a tube down her throat and her hands restrained so she wouldn't remove it. Hanna said the first thing she remembers is waking up to her mom holding her hand. After taking two respiratory tests to prove she could breathe on her own, the tube was taken out. She explained that doctors and nurses stressed how lucky she was to be alive, even asking her if she was trying to kill herself by drinking so excessively. Hanna said she realized that she would never look at alcohol the same way again. In the aftermath following the horrific experience, Hanna said she quickly learned who her true friends are based on their reactions. While others genuinely wanted to know if she was OK, she could tell others were calling because they wanted gossip about what happened to her. Hanna went on to cite a statistic from the Centers for Disease Control and Prevention that says alcohol poisoning kills six people in the US each day. The college student noted that she doesn't expect people to shun alcohol, but she urges them to avoid binge drinking. She credits her friends for saving her life. 'I could've been left alone to "sleep it off",' she said. 'I can't tell you how many times I've heard the phrase, "Let them sleep it off, they'll be fine in the morning," but I'm alive today because my friends got me help. Today is my 21st birthday, a day I have been looking forward to for quite some time now. Due to an event that happened about six months ago, I will not be taking birthday shots and getting wasted tonight. Instead, I plan on having dinner and maybe a glass of wine with my closest friends and family. I am writing this because I didn't realize the importance of drinking responsibly until I was waking up from a coma, and I don't want anyone to go through what my family and I went through. I ask that you share this with your friends, family or anyone who may benefit from reading this. If I can help just one person by sharing my experience, then I will be absolutely ecstatic. Reno, Nevada -- July 26, 2015: A photo from the emergency room an hour after I arrived at Renown hospital. At this point I was not responding to verbal or painful stimuli and the ventilator was breathing for me. I was completely unresponsive. July 27, 2015: The first thing I remember is my mom holding my hand, telling me I was going to be okay. I felt like I was dreaming. Everything seemed foggy. I drifted in and out of consciousness for the next few hours. I was coming out of a 24-hour coma. On the morning of July 25, 2015, I thought I was going to have a fun day with friends at the Night in the Country music festival in Yerington, Nevada. I woke up, had breakfast and started what would end up being the worst 48 hours of my life. The first part of the day was a lot of fun. We met new people, played human foosball and had a really good time. After dinner, we went to the Joe Nichols and Jake Owen concert. At the concert, I had two beers. Many of the people I was with had been drinking throughout the day and were already feeling good. I hadn't started drinking until a little after dinner and I felt a little behind. My problems started after the concert. I was beginning to feel a little bit of a buzz and drifted off from the people I went to the concert with. I ended up at a campsite where I found some of my other friends. I am a competitive person by nature and this group was mostly guys who (for some reason) I promised I could outdrink. Around 11:30 p.m., one of my guy friends and I were seeing who could take the longest chug from a bottle of "Black Velvet Whiskey." July 26, 2015: Everything that happened from midnight on is information I gathered from friends because I have zero memory of anything after that. Apparently after I chugged from the bottle, I chugged a solo cup full of "Black Velvet Whiskey." Immediately after this, I told my friends I felt fine, and about five minutes later I collapsed. I wasn't breathing. My friends picked me up and started carrying me to the medical tent. From there I was intubated and taken to Renown hospital in Reno, Nevada via care flight. Meanwhile, the police showed up at my house to tell my parents to meet me at the hospital. I was in critical condition, suffering from acute respiratory failure and acute alcohol intoxication. My blood alcohol concentration was .41 when I arrived at the hospital, five times over the legal limit. The doctors thought I was brain dead because I was completely unresponsive. My pupils were sluggishly reactive, I had no corneal reflex and I wasn't responding to verbal or painful stimuli. I finally woke up about 24 hours after I arrived at the hospital. I had a tube down my throat and my hands were restrained so I couldn't pull it out. I was unable to talk with the tube down my throat, making it hard to tell my parents and the nurses that it was extremely uncomfortable. I had to pass a respiratory test to prove I could breathe on my own before they removed it. I failed the first respiratory test I took, and I had to wait several hours to take another test. When I passed the second test and the tube was taken out, the doctors and nurses told me how lucky I was to be alive. They told me that they didn't think I would make it through the night. They asked me if I was trying to kill myself by drinking so much. This question hit me the hardest. 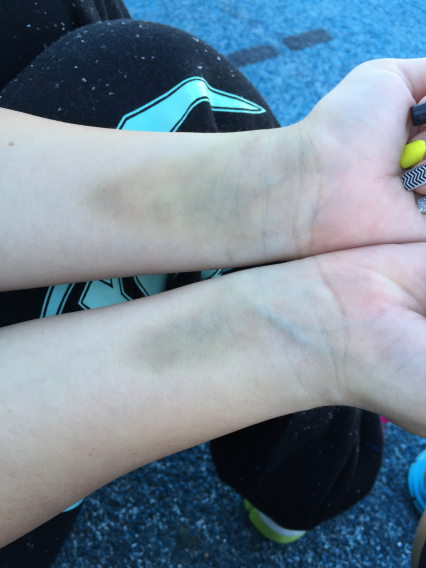 Reno, Nevada -- August 5, 2015: Bruises from blood tests during my hospital stay. This picture was taken several days after I was discharged from the hospital. I've heard a lot of rumors about what happened to me. I heard a rumor that I overdosed on drugs (blood tests found ZERO drugs in my system). Someone even told a friend of mine that I died. I received texts from people asking me what happened without asking if I was okay. This event taught me a lot about who is there because they actually care, and who is there because they are curious about what happened. Despite the handful of people who didn't really care, there were so many people who genuinely cared about my health and safety. I appreciate every one of these people and can't thank them enough. The CDC also says, "Very high levels of alcohol in the body can shutdown critical areas of the brain that control breathing, heart rate, and body temperature, resulting in death." About six people die from alcohol poisoning each day in the U.S. I'm not asking that everyone avoid alcohol altogether because that is unreasonable, but please try to avoid binge drinking and heavy drinking because the consequences are not worth it. This situation could have been so much worse. Fortunately for me, I had good people around when all of this took place. I could have easily been taken advantage of when I passed out. I could've been left alone to "sleep it off." I can't tell you how many times I've heard the phrase, "Let them sleep it off, they'll be fine in the morning," but I'm alive today because my friends got me help. Don't take a chance if you see a friend passed out from drinking too much. Get them help as soon as possible. I'm very lucky to have made a full recovery, but I know there are others who won't be as lucky. So please drink responsibly and make sure your friends do too. Watch out for friends, family, even strangers, and take care of them when you suspect they might be suffering from alcohol poisoning. Know the symptoms and be safe. This post originally appeared on HLottritz.wordpress.com.